When you want to escape the world to a world of your own, the thinks of Holidays to Andaman & Nicobar Islands. Blessed with unmatched natural beauty, the archipelago of around 300 islands in the Bay of Bengal is truly heaven on Earth. Andaman Holidays are ideal for couples on honeymoon, families, nature lovers and adventure enthusiasts. The paradisiacal islands are believed to be one of the most romantic destinations in India, which is why Andaman honeymoon packages are quite popular among couples all across the globe. The serene golden shores, the cerulean waters and even the lush tropical landscape have a number of amazing things to do. Relax, try adventures or go for new experiences, the island archipelago has it all. Try out the thrilling sports such as scuba diving, snorkeling, parasailing, etc. and other adventure activities like glass bottom boat rides, kayaking, wildlife spotting and trekking. Holidays in Andaman help you escape the mainland, the chaos of cities and bask in the bliss of nature. The soothing soft sands, the melody of waves, the landscape of blue and greens is alluring. For unforgettable romantic vacations, Andaman is like a dream come true. The entire ambiance is rather enthralling but it is the resorts truly seal the deal. 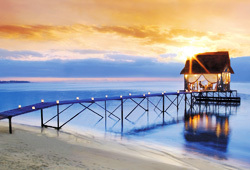 Luxury beach resorts with amazing 5-star facilities enveloped in natural environs. You will never want your holiday in Andaman to end. Planning to visit with family, your loved one, with friends or solo? Browse through our Andaman holiday packages!